Situated on beautiful Turner’s Beach, on the Southwestern coast of the island, is a couples only, all-inclusive Antigua resort unlike any other. Keyonna Beach Resort Antigua is a quaint boutique hotel offering a beachfront location with sweeping views of the colorful Caribbean Sea. A collection of rustic, yet luxurious cottages located just a short walk away from the beach, Keyonna is best suited for couples and honeymooners seeking a romantic and relaxing getaway in a scenic, stress-free environment with excellent food and drinks and in the company of happy, friendly people. 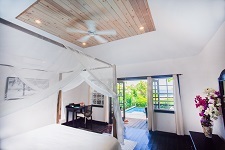 All cottages include king-sized four-poster beds, spacious bathrooms with unique his and hers outdoor showers, air conditioning, personalized in-room mini bars and free WIFI. There are no televisions or radios because our aim is to have you focus exclusively on each other and not be distracted by the monotonous humdrum of everyday life. Each cottage also includes a large private veranda with comfy deck chairs from which you can view the spectacular sunsets that paint the horizon each evening. Our on-site beachfront restaurant is a multi-tiered, wooden terrace offering al fresco dining beneath a canopy of seaside grape trees. The menu is an eclectic mix of West Indian cuisine and fresh local seafood. A choice of vegetarian dishes is also available and special dietary requirements are accommodated on request. Service is a la carte for all meals and there are no buffets. There are never any crowds on our 1000 foot long, deserted, white sand beach, which is dotted with an assortment of cozy Bali Beds each offering a front row view of the beautiful seascape punctuated by the silhouettes of neighboring tropical islands. The Bali Beds are a perfectly unique way to nap, after a swim, in the arms of your partner or to simply relax together while sipping on our famous cocktails and rum punches and enjoying the view. We invite you to book your dream vacation with us without delay. Our small size means that availability is frequently limited. Sign up for our VIP Club for savings on our regular rates and exclusive benefits. We commit to doing our very best to ensure that your stay with us is one that you will cherish and always remember. And more importantly we want to make sure that when you leave us you do so deeper in love with each other than you ever were before. 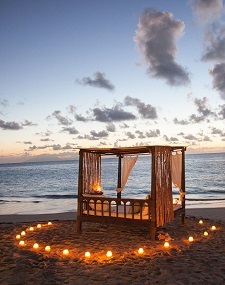 We welcome you to romance, to tranquility and to our charming little slice of paradise. We welcome you to Keyonna Beach Resort Antigua.